Herb Salad’s 100% Organic ingredients are the leaves, roots, bark and flowers of the plants that animals in the wild seek as a means to obtain required nutrients, minerals, vitamins and healing capabilities. It differs from food and water additives such as vitamins and medications in the manner that it allows your birds to choose what it is they require and in what amount, when and if their diet needs supplementing. Herb Salad’s 22 medicinal herbs address common health issues safely and without the dangers that improper medicating and over supplementing can produce. Why Do My Birds Need Herb Saladtm? Herb Salad is not only for sick birds. It's also beneficial in maintaining the health of the fit bird, in a safe and natural way. The advantages Herb Salad provides the bird receiving medicinal care is in the support it offers sick birds suffering the adverse side effects that medications can produce. It helps stimulate appetite, strengthens the immune system, and encourages good bacteria growth. Sometimes, Herb Salad can even furnish the solution re: the ill bird not responding to treatment when it is due to the fact that the drug(s) being administered is not addressing the problem or is only combating part of it. Enabling your bird's ability to self-medicate can be a life-saver. Will my bird like Herb Saladtm? Birds instinctively know medicinal plants are a necessary part of their natural diet. Your bird's initial reaction to Herb Salad can vary, depending on the individual bird and the circumstances. Most birds immediately try Herb Salad and begin consuming it on a regular basis. In some cases, your bird may ignore it until a health matter, e.g. vitamin deficiency, stress, injury, illness, etc. compels him to seek relief. Time may be needed for your bird to *learn* to eat Herb Salad, especially finicky eaters resistant to new foods. Don't remove it right away if it goes untouched. Keep it dry and clean, and leave it in his cage. It is the rare bird that doesn't eventually discover what makes him feel stronger, healthier and happy. When do my birds need Herb Saladtm? Herb Salad should be available to your bird at all times. The benefit of regular access to the healthy bird is in permitting them the opportunity to address health issues, vitamin deficiencies and illness before the onset of the changed behavior or eating patterns that alert us to a health concern. The merits of early prevention can be crucial for breeding hens and babies, as well as the smaller and more delicate species. Stressed and recovering birds also profit from the constant availability to Herb Salad with its many function-specific herbs. How do I feed Herb Saladtm to my birds? The fundamental principal behind Herb Salad, and what it affords your bird over food and water additives, is in the way it gives your bird the power to choice. This is best accomplished by feeding Herb Salad in its own container. Desirable, are shallow dishes that allow easy access to the entire supply, rather than just surface contents. A shallower container will also help eliminate waste brought on by digging birds searching for individual herbs. To help acclimate the fussy eater, Herb Salad may be added to their seed. We do not recommend adding it to soft or cooked diets. 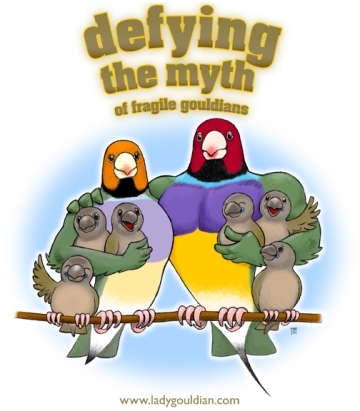 Twin Beaks Aviary's practice has been to provide our birds with all the necessary elements in maintaining superior physical and mental wellbeing, while allowing them to choose *what, when and how much* when it concerns their diet. We consider Herb Salad essential to our feeding program, but not as an alternative to veterinary care and recommended medications or in substitution of supplementing proper nutrition with vitamins. Success has depended upon the species of bird, health history and eating habits. We believe however, that whatever your feeding practices are, your bird's diet and welfare will surely be enhanced with the inclusion of Herb Salad. "I've been maintaining and breeding all species of birds for over 30 years and began developing Herb Salad in 1989 after learning about animal self-medication. We ensure that every bird in our aviary has unrestricted access to Herb Salad. Our breeding success, minimal use of medications and low incidence of illness is a testament to its effectiveness. 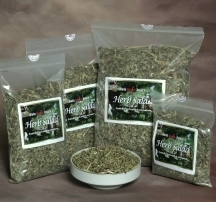 We consider Herb Salad essential to our feeding program." We don’t advise mixing Herb Salad™ in with egg food, soak seed or anything moist. Because of the medicinal properties of the herbs, your birds should be able to choose which herb it wants and the quantity it desires to eat. No. This would make it very difficult for your bird to pick out certain herbs. Also, birds generally don’t prefer powdered mixes. Certainly! All species of birds will enjoy the benefits of Twin Beaks Aviary’s Herb Salad™! I was just wondering how long the herbs will stay fresh and how to store them? I have an African Grey coming to live with us in Aug. (after being weaned) and don’t know how much to order or how to feed it. As long as you keep it dry (refrigeration not necessary), our herbs have a shelf life of up to 2 years. Young parrots seem to take instantly to Herb Salad™, some need to *learn* what it is… Provide a cup large enough to contain a well mixed blend, but try to locate it in an area of his cage away from his food and water sources so that it stays clean. They’re extracting nutrients by *mouthing* or *playing* with certain herbs, especially the larger pieces. I don’t know if I can afford another food supplement! This is not another supplement nor a medication, rather a deterrent to illness and an encouragement to wellness. I think of the herb dishes like my bird’s little medicine cabinet. Contents for what ails them when they don’t feel good! Don’t stop using any supplements you are already using. If your bird’s diet is deficient in any areas, Twin Beaks Aviary’s Herb Salad™ will help correct this. How long can I keep my herbs before they’re too old to feed to my birds? I’m confused... Should I treat my sick birds with your herbs instead of medicines? No. Always seek veterinary care for sick bird. Usually, by the time you notice your bird’s not feeling well, it’s quite ill. Twin Beaks Aviary’s Herb Salad™ allows your bird to combat illnesses before the apparent signs that alert the bird keeper. Herb Salad™ will not cure disease, but it can aid in recovery and help to repair any deficiencies or damage done by the illness or the medications. Some of these herbs aren’t indigenous to the country that my birds come from. Will they still eat it? If I understand you correctly, you’re concerned that our herbs that may have been exposed to our birds/bird room? Our business is in a totally separate building used exclusively for Herb Salad™. Some of the herbs repel mites, especially the pau d’ arco bark (the brown strip-like pieces). We have some birds do that, as well. It’s not advised to grind up the herbs. This makes it difficult for birds to pick out certain herbs, plus, most birds will ignore powered foods. We allow the occasional birds who wish to, use the pau d’ arco for their nests. It’s repelling parasites such as mites. Wow, do you sell pau d’ arco bark by itself? My birds have been scratching for months! We don’t sell any of the herbs individually. Thyme, milk thistle, wormwood... all fight parasites and worms, as well. But, your birds should get enough of all these from Herb Salad™. Wood shavings are a natural insecticide, inhibit the growth of bacteria and repel parasites such as mites (avoid cedar and pine, though) One of the ingredients in our nesting material is aspen. It’s much cheaper than pau d’ arco bark. Do your birds have enough access to bathing? This could be a possible cause for the scratching, especially when humidity is low such as in the winter months. Can I add your herbs to my bird’s seed? This may be a good way to introduce Herb Salad™ to your bird’s diet, but over time I’d be concerned about waste. Be sure they’re eating it all! My bird loves your herbs--though he’s very selective. Herb Salad™ is working as it should with a selective bird; he’s selecting the herb(s) he needs to address a particular need, e.g. deficiency, ailment, emotional. We recommend you add to his daily supply, mixing it in with the existing, so that he keeps getting what it is that he’s seeking. My birds are just worn out from traveling from show to show this year and now it is almost breeding season for them. I have about 60 doves who could use a boost! Have you ever tried making a tea out of Herb Salad™? We’ve had several people report success having made a tea out of Herb Salad™. A breeder friend of mine was doing that with her own flock. However, one of the main values and distinctions of Herb Salad™ and its recommended feeding guidelines is in allowing the bird to pick when, and what type of herb it needs. In tea form you’re *force feeding*. Providing it as a stand-alone is our recommendation. It’s been reported to me many times, as well as seeing it in my own aviary, that Herb Salad™ cured an ill bird when medication couldn’t. There are several different reasons that make this possible… The bird’s illness hasn’t been correctly diagnosed, so proper medication isn’t provided. The bird may be suffering multiple illnesses and the meds are only addressing part of the problem. Or, it could be that the medicines themselves are causing additional problems, side effects. Replenish Herb Salad™ often so that your bird doesn’t run out of the particular herb(s) he needs. Keep trying to find the right medication.